Religion of the Future is a letter written by Arthur Conan Doyle first published in the Evening Standard on 7 december 1923. The letter is a reply to Dean Inge's article Is Protestantism Played Out? of the 5 december 1923. How many Anglican pulpits would venture to sustain the creed of a personal devil or of everlasting punishment? Have we not heard a Bishop declare that a man is the same an hour after death as an hour before? He was perfectly right in so declaring, but it was never the teaching of the Protestant Church, and the liturgy still upholds the last trump and the belated resurrection of the body. But there must and will be other changes, many of which will be in the Roman Catholic direction. This process has clearly already set in for if there is no eternal hell, then there must be Purgatory, or a temporary place of purification. Thus this essentially Roman Catholic doctrine is tacitly admitted. Our own knowledge, gained from hundreds of independent communications from the "dead," is that the whole world beyond is one vast purgatory, not in the sense of suffering, for in the main it is supremely happy, but as being a long succession of graduated experiences all tending to higher spirituality. Therefore we know that this doctrine represents a truth, and we know also that our prayers are very welcome and helpful to all those who are in these spheres, even as their prayers are beneficial to us. Thus a second Catholic belief becomes justified, though venal prayer in return for money is, of course, a barren and useless rite. "Pray for us" is one of the most common messages which we got from the beyond. There are other points in which Protestantism must retrace its steps and adopt the ideas, while it avoids the errors, of the older Church. It has lost touch with the Spirit, which is the very centre of all living religion, and it must hark back and seek this inspiration once more. Without it it is a dead thing, basing itself upon memories instead of realising that the vital forces of old are still with us in full power if we will but give them a place in our scheme of thought. The Roman Church has preserved this true outlook, though blurred with the ages. It still admits the possibility of "miracles," which are in truth but the operation of natural forces, there being no bard lino of demarcation between matter and spirit, and all being covered by Nature. 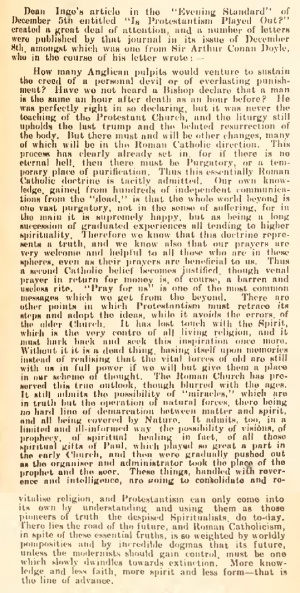 It admits, too, in a limited and ill-informed way the possibility of visions, of prophecy, of spiritual healing in fact, of all those spiritual gifts of Paul, which played so great a part in the early Church, and then were gradually pushed out as the organiser and administrator took the place of the prophet and the seer. These things, handled with reverence and intelligence, are going to consolidate and revitalise religion, and Protestantism can only come into its own by understanding and using them as those pioneers of truth the despised Spiritualists, do to-day. There lies the road of tho future, and Roman Catholicism, in spite of those essential truths, is so weighted by worldly pomposities and by incredible dogmas that its future, unless the modernists should gain control, must be one which slowly dwindles towards extinction. More knowledge and less faith, more spirit and less form—that is tho line of advance. This page was last edited on 1 October 2016, at 23:31.